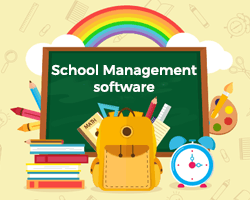 A school Management Software is the one that helps school administration to manage and do all there work with help of that software, this software helps schools and their staff by reducing their paperwork, and tasks spread across webby work levels. 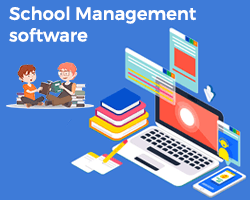 School Management Softwares can be designed on a preset pattern in accordance with conventional school Requirements or it can also be customized as per the needs of Schools as schooling nowadays is not all about books, bags, and sketches. Schooling is now a complete package that includes studies, child development, extracurriculars, sports,post-school activities, and many other things. so there is a benefit for schools that they can have a school management software as per their requirements. 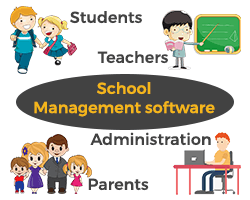 There are various modules that can be included in a school management software, it totally depends upon the requirements, strength, and capacity of developers. 1.Attendance – It is one of the popular modules that always makes its place in the software, through attendance schools holds records of their students, and with the help of Attendance feature, Teachers can mark the attendance and make online or backup record with using a single piece of papers, on the same time parents do can track the attendance record of their child and his/her presence in school on daily basis, not a good thing yaaa but sometimes irritating for students lol. 2.Fees – It is another very important module that comes in every good school management software, with the help of Fee management module provided in school management software, schools can have the records of all the fee transactions separately for each student. This module provides every information about fees, like how much fees have been received, which student has not paid the fees, a total of all fees received from each student, each class and each school also if some school has multiple branches. By using Fee module school can generate fee receipt, that can be printed by students and parents. wow that really a great thing, instead of waiting for your number in a queue for payment of fees, you can pay your fees through the software/app and have the payment information instantly. 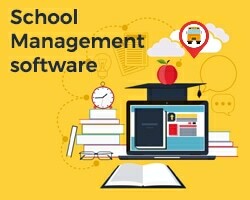 3.Bus Tracking – This is, in my opinion, one of the necessary modules to be included in a Good School Management software, with a regular increase in crime against children, every parent whose child is going to school keep worried about their child while away for school, so through this module ie. Bus Tracking parents can track live location of the school vehicle and gets every second notification, here I recommend “SkoolApp” it is a school Management software which provides all the above-mentioned modules and many other which I will later share, but their school bus tracking module is so awesome that Schools can’t even need to have GPS connectivity, all you have to do is to download the app of SkoolApp in Drivers Mobile who is running the vehicle, and school admins and parents both can track the location of vehicle at every single point and routes. 4.All Round Communication – This module erases the communication gap between parents and schools, usually teachers had interaction with the parents on PTM’s that held on month end or sometimes after every 2 months, but through this module of all in one communication, parents and teachers can interact at any time about the child’s activity,performance etc, schools can send the student reports and parents can ask about their child’s improvements and academic growth or some other things. Above mentioned are some basic modules that are the part of a Good School Management software but there are many other modules which are also included in this, many time schools even demand a specific new module based on there requirement and necessity. Report cards – By using these modules students can get there result on there app and generated progress report aka report card and have a print of it if required. Post School Activites – Nowadays many schools provide many facilities to there students after school time like music classes, art n craft, sports, workshops etc. so through this module, students can get the alert and messages about the schedule of their respective classes, postponed status and event notifications, and other alerts. Same way its easier for schools to send one notification together to all students through one portal instead of sending random messages. Library Management – Through This Module Schools can manage their library, record of books,book-stocks etc. Smart Study Module – This Module is a cup of benefit both parents, schools, and students also. Through this module Schools can provide some extra study material to their students in order to make them more prepared, can also place online experts helpdesk through which students can ask their difficulties to them, on the other sides, students can preplan their course curriculum and can be a step ahead of other students of their class or batch, a student can also have self-assessment by using test series etc. There are other modules also like holidays, Gallery, parent alarm, homework etc, which added or reduced as per the need of schools. 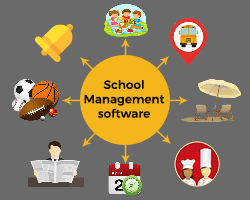 So Above I wrote about School Management Software, what is it, its features, its benefits, how it is helpful for Schools, parents, and students. I would like to hear from you, give your suggestions and comments. Thanks for reading.